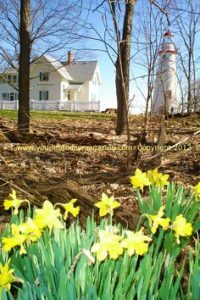 Daffodils and lighthouses are both symbols of hope and perseverance for me. When I passed my freezing daffodil buds this morning, I thought about how persistent and brave they are to push through the hard, frozen ground. Once they emerge, they get buried in snow and pounded with hail and yet keep standing and growing…perennial signs that spring is on the way, so don’t give up hope! Their sunny, cheerful faces are the only bright spots in the brown and grey mud once the snow melts. Just one week before this picture was taken a few years ago, Lake Erie was still frozen with thick ice several feet out from the shore, and it was very difficult to get to this spot because of the snow. We all need that kind of resilience and unlikely cheerfulness in the face of adversity.